Prof. Ernest Aryeetey, Vice Chancellor of the University of Ghana, says government needs to invest in Materials Science and Engineering to ensure sustainable economic transformation. According to Prof. Aryeetey, Materials Science and Engineering is key research area which holds immeasurable potential for economic growth and security, especially for developing countries like Ghana that are endowed with natural resources. 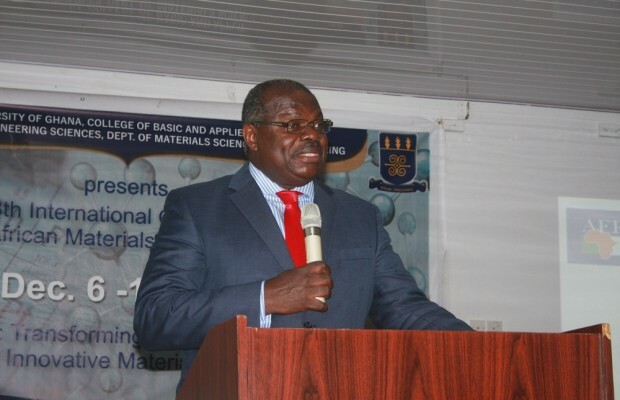 Speaking at the 8th International Conference of African Materials Research Society on Monday, Prof. Aryeetey said materials science and engineering research is critical in unlocking the economic value. “While Ghana is richly endowed with mineral resources, there is a pressing need for mineral resource beneficiation to unlock their economic value and to create more jobs. In this context, materials science and engineering research and technologies are critical to the integral contribution of our natural resources to sustainable economic transformation,” he stated. The African Materials Research Society (MRS African 2015) International Conference, hosted by the University of Ghana, Legon, is the first of its kind in Ghana. The conference helps to disseminate knowledge and establish links between academia, government and industry. He added that MRS African conference mainly provides students, scientists and engineers from the African continent with a unique opportunity to share experiences with their counterparts from various parts of the globe. “Today, this goes well beyond traditional considerations of cements, alloys and plastics. It includes new, promising areas of growth such as nanomaterials and nanodevices, with a potential impact on all areas of life, ranging from biotechnology, communications, smart materials, oil and gas, environment, electric power, textile, construction, electronic, transport, mining, manufacturing and agricultural industries,” he said. Prof. Ebenezer Oduro Owusu, Provost of the College of Basic and Applied Sciences, disclosed that Ghana would not develop if the country does not pay attention to the materials science and engineering. “Material science research is the bedrock of our national development. As a nation if we do not pay particular attention to science and materials engineering then there is no way we are planning to develop our country,” Prof Owusu. He noted that Ghana needs to consider industrialization to grow the economy and create employment for the youth. “Science cannot be left out on the journey of development. We need to create a knowledge society and a knowledge economy so that we can move forward as a nation. Our youth would be employed when we adopt these methods. We create employment when we create industries. President for MRS Africa, Winston Wole Soboyejo, commended Ghana for investing in the education. He urged government and industry to support the group to look at innovative ways to extract, process and add value to Ghana’s resources.